Your company's license needs depend on the size of your company. You will need a license for every person who accesses the contractor management software but you can control the level of access each person has. There are four levels of access comprised of administrator, office manager, sales rep, and assistant. The administrator has full access to all levels. An office manager can have access to all pages with the exception of project costs, contracted pay agreements, commission controls, and profit and loss categories. Sales reps are limited to customer information, estimates, and total invoices. Assistants are limited to only customer information. 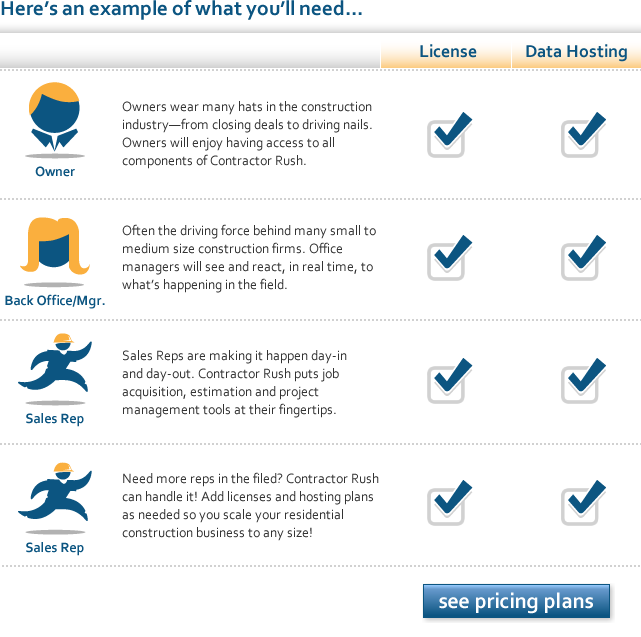 For more information, contact us and we can help you decide how many licenses you will need for our contractor management software.